Our Sewing Center (Model 375) is designed for accommodating your sewing machine and serger. It also provides plenty of work space for your sewing projects. We build the sewing center in two widths, 58” wide or 61” wide. 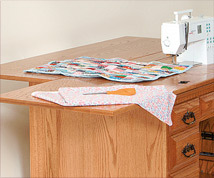 The 58” wide Sewing Center holds machines up to 18” long. Sewing Centers built 61” wide hold sewing machines up to 23” long. The sewing machine is positioned in the center of this hardwood cabinet. For your convenience, we install an airlift, allowing you to effortlessly raise and lower your sewing machine. To the left, we build a set of four drawers within easy reach for storing your sewing supplies. All the drawers are 7 ¾” wide by 18 ¼” deep. The top drawer is 3” high, the two middle drawers are 4 ¼” high, and the bottom drawer is 6” high. The “drawers” in the middle of the sewing center are fake fronts, adding beauty and character to the cabinet. To your right, we created a space for your serger. With a turn of your chair, you can go from sewing to serging! The standard models come with a manual lift for the serger. However, we do have a soft close option that makes it more convenient to raise and lower the machine manually. Or if you prefer the electric lift, we can customize the cabinet for you for an extra fee. An extra wing out the right side and an optional quilter’s table out the back give you ample work space. Both of these fold up to make a compact sewing center that doesn’t take up more storage space than necessary. Contact us today to find out how we can build a storage center that meets your needs! We will be happy to create a custom quote for you.